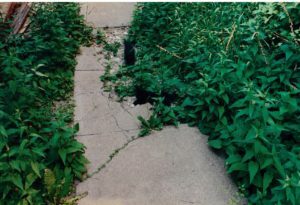 On a warm June day in 2002, two little black kittens showed up in my back yard, hiding in a pile of lumber scared and hungry. I fed and watered them, and later in the day they let me pick them up and cuddle them. Skinny and Shorty were here to stay! They were the cutest little kittens. Both were so tiny they could both fit in my hand at the same time. It didn’t take long for them to grow bigger, but they never were big cats. I think it was because they were taken away from their mother too soon. Mackie didn’t think much of them. Lots of growling and hissing, before she accepted them, but never entirely liked them. That they used to tag-team Mackie didn’t help matters any. Skinny in particular liked to give Mackie rapid-fire patty-bats when Mackie was trying to sleep. Not good for relations! Shorty was a loveable one, the moment she saw your had coming to pet her she would “plop” down and start purring, dragging herself next to you and just soaking in the attention. She was my little “plump of love”, and had a cute paw-gesture when she wanted to be let on the back porch. They were strictly indoor cats from the time I brought them inside, but they could go on the front or back porch if they were being good. We had 12 wonderful years with Shorty before she had to go to Rainbow Bridge. My poor baby got cancer and there was nothing we could do for her but love her. Skinny is still going strong! She’ll be 16 this year. I think it’s time for a party, don’t you? Here are my two Itti Bitti Kitties when they first came to live with me!